Tattoos: Dragon tattoo on her upper right arm and a small butterfly one on her ankle. Likes: Pizza, Lamb Kebab, Old Cartoons, romcoms and Musicals, Late 20th and Early 21st Century Clothes, especially Party type clothes, Computers (she is an expert on getting into things via back-doors) Reading. Other Family Aunt and Uncle living in the Welsh Eurasian Hills on Earth. General Overview Jasmine has a Warped and Dirty sense of humour that is not usually appriciated. Jasmine has always had a knack for picking up and quickly being able to speak different languages, but only if she wants to. Personal History Jasmine Lynne Somers was born in the Eurasian Territories on Earth on Stardate 30643.72(23 August 2353 at 2300 hours), she had a happy childhood and being born into an influential family she wanted for nothing, on her eighth birthday she excelled at her first real exams. Her Father David Lloyd Somers, Mother Alison Dennings had only one child and that was Jasmine Lynne Somers. She was given an aptitude test on her Tenth birthday and it was discovered that she had a very high IQ and quick learning ability. By the time she was 16 in 2369 she had mastered most of the human martial arts , then by the time she had turned 21 in 2374 she had mastered the Klingon Martial Arts all at Level 3 and was fluent in four languages. She had mastered All Klingon bladed weapons from Expert Level/Advanced and to Experienced level. She was essentially a child prodigy, but not mainly in the mental sense, she had a knack for picking up languages, but only ones she found interesting. As she grew up she had a semi-privilaged upbrining as her father was brother to [[Alexandria Somers]] Father Samuel Somers, so she spent many a day during her youth with her cousins. As the young girls grew older all began to develop certain interests, not all meshed; Jasmine and Alex applied to Starfleet Academy, Alex decided to go the SFMC route even thought she passed high in the Academy enterance test. Jasmine went into the Academy and passed out as a Fleet Officer, over time she changed from fleet over to Marines eventually gaining the rank of Lt. Colonel in (Bravo Fleet) up until a schism in the fleet forced her to go to a newly created Alpha Fleet, but due to bad organisational skills on behalf of the original Founders of Alpha Fleet it imploded and once again Jasmine and her ship the [[USS Tomcat]] was adrift without a Fleet and remained Fleet free for a time, eventually she joined Pegasus Fleet and due to Fleets set up had to change back to Fleet and drop a few ranks until she could prove herself in this new fleet. Now a full Captain again she is tasked with scouting an unexplored system in unclaimed space; despite its designation a Starfleet Explorer ship did pass through the system but did not stay long enough to do in depth scans. Service Record Stardate: 236801.01 Applied to join Starfleet Academy age 18 and passed 3rd from top. Stardate: 237309.03 At 23 years old and at the rank of Ensign was posted to Deep Space 1 as a Security Officer. 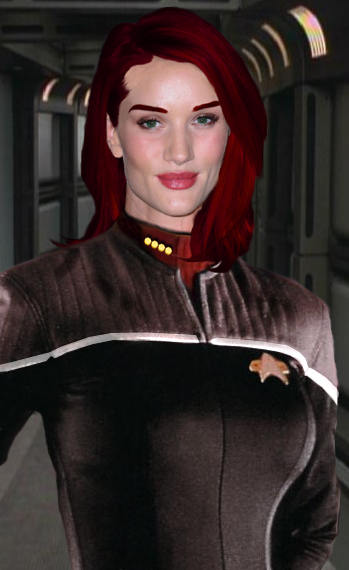 Stardate: 237405.01 Posted to the USS Lexington as a Tactical Officer and promoted to Lt. Jg. Stardate: 238403.24 posted to Sol-Sector Earth for advance Security and Tactical Training, promoted to Full Lietenant at the end of training. Stardate: 238408.18 Reported to the Newly comissioned USS Comanche under the command of Lt. Colonel Morgan. Stardate: 238611.11 Changed Departments from Tactical to Marines. Stardate: 239106.01 Promoted to Captain. Stardate: 239201.01 On a Mission for Starfleet out in unclaimed space.